I am a freelance Playwright, Director, Lecturer and Workshop leader in Theatre and Stage performance, based in the South West of England near the city of Bath. I specialise in creating challenging and entertaining plays for performance by young people in the 11-21 age range. I have also created theatre in education pieces for professional companies. My plays have been performed all over the United Kingdom, in Europe, Australia and even Asia. You can find details of how to purchase the plays and how to obtain licences for performance. Updated Last Resort now available! The Last Resort has been hugely successful over the last few years with many productions taking place all over the country. To build on this success, I have recently completed a full revision of the script of The Last Resort to bring it up to date. The narrative itself remains largely unchanged although the ending of the piece has been slightly altered. Terms and references have been changed to make them appropriate for 2009. Although only first published in by Hodder and Stoughton in 2001 the pace of change has been considerable. A significant advantage of publishing in a digital format is that it is possible to update and modify the script quite easily to ensure that it does not become a period piece. All new purchasers will be sent the new version of the script. If you have already purchased a full copy of the original digital script and would like a copy of the new script, please contact me with your registration details and I will send you the updated script free of charge. Try getting a deal like that from a conventional publisher!  I hope to shortly release a new script: It Came from Somewhere Else! This was delayed due to a lack of webspace for a dedicated section. This has now been rectified by a change to a new provider and the new section will hopefully be online sometime after Easter. The play itself is inspired by wonderful 1950's Sci Fi B movies such as The Creature from the Black Lagoon, The Day the Earth Stood Still and The Invasion of the Body Snatchers. It is a fast paced, funny and colourful romp that is sure to become a popular perfomance piece for schools and colleges everywhere. Performance Rights. 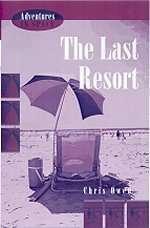 The Last Resort and A Mother's Voice were originally published by Hodder and Stoughton. With their transfer to digital format, I am also now handling all performing rights applications for these plays. If you have an original copy of either script as published by Hodder and Stoughton, please disregard the notice concerning applications for performance licences contained within these books. Applications for all performances must now be made directly through me. Children of the Blitz - is now available! It is a full length play for the 11-16 age range (with some parts suitable for adults and older students) which deals with the evacuation of children in the second World War. This is an energetic, entertaining and thoughtful look at the challenges that the evacuation process presented - in particular the clash of cultures brought about by the introduction of "town" kids into a rural environment . This is a well researched piece that would make a good focus for a whole school project! Follow the links for further details. 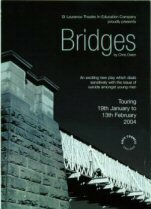 Bridges is now being made generally available for the first time. This professional production, dealing with the sensitive issue of teenage male suicide, toured schools and youth centres in January and February 2004. Both the play and the 60+ page support booklet are now available to professional companies and for amateur production. Please feel free to contact me about my plays and regarding commissions, directing or theatre workshops. I will always try to help where I can.